A college lecturer believes he has found proof that the woman said to have played a key role in defeating the last army to invade Britain really existed. 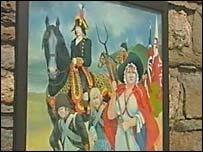 Pembrokeshire man Andrew Thomas claims he has found the baptism records of Jemima Nicholas, who tricked French troops into surrendering in 1797. Nicholas told local women to dress in a black-and-red traditional costume, and the French thought they were soldiers. But the origins of the heroine, who died in 1832, have never been proved. Mr Thomas was researching his family when he found what he claims is Nicholas' baptism records. The county's records office in Haverfordwest has a record which shows a Jemima Nicholas was baptised in the parish of Mathry on 2 March 1755. This would have made her 41 at the time of the French invasion, close to contemporary accounts which put the Fishguard shoemaker at 47. Nicholas became part of Welsh folklore for her part in the deception of 1,200 French troops, who landed in west Wales with plans to attack Bristol and London, but who quickly descended into a drunken rabble.